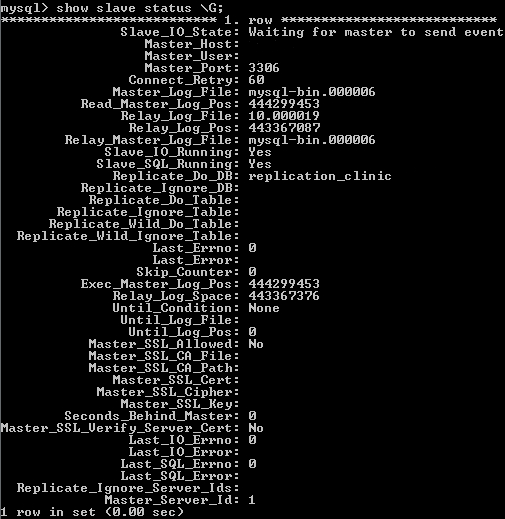 MySQL comes with its own Replication capabilities. Make sure to use Statement Based Replication, and NOT Row Based Replication. Note: The recommended steps below include setting up auto-increment variables to avoid data collision. If you already use random primary keys instead, see One-Way Replication (random primary keys). Stop the MySQL Service on both the Master and Slave (net stop mysql). On some operating systems, this will require you go into the system services in Control Panel, Administrative Tools, Services and stop the MySQL service manually. If the MySQL service is started on the Master or Slave before step 5, then replication on the Slave will fail. On the Slave, wipe out all loose files in the mysql data directory which do not reside in a subfolder, except for any files beginning with ib (e.g. iblog_file0, ib_logfile1, ibdata1). Make an identical database copy from Master to Slave. The replicated database must be exactly the same before replication begins the first time. If the one-way replication server is being added to an existing daisy chain, the database copy must be a snapshot of the database from the point in time that the daisy chain was setup (before any SQL statements were ever replicated). If you do not have this older copy of the database, reset the daisy chain immediately before copying the database to the one-way server. Make sure the master and slave are synced to the same date and time. Start the MySQL service on the Master and Slave (net start mysql). On some operating systems, such as Windows Vista, this will require you go into the system services in Control Panel, Administrative Tools, Services and start the MYSQL service manually. On the Slave, point the Slave to the Master by running a command similar to the following (run the following MySQL queries): Go to the command line and change the directory to C:\Program Files\MySQL\MySQL Server 5.5\bin and type the following: mysql -u root opendental where opendental is the name of the database. Set MASTER_HOST to either the IP address or computer name of the Master. Run the following queries on the Master to grant permission for the Slave to read data. This step is easy to get wrong. The opendental. * should be the name of your mysql database and must be lowercase. The . * means everything within the specified database. Run the START SLAVE; in the mysql command interface on the Slave. Run the SHOW SLAVE STATUS \G; in the mysql command interface on the Slave. Make sure that the Slave IO Running and Slave SQL Running columns both say, Yes.